For the recently developed specification language CASL, there exist two different kinds of proof support: While HOL-CASL has its strength in proofs about specifications in-the-small, Maya has been designed for management of proofs in (CASL) specifications in-the-large, within an evolutionary formal software development process involving changes of specifications. 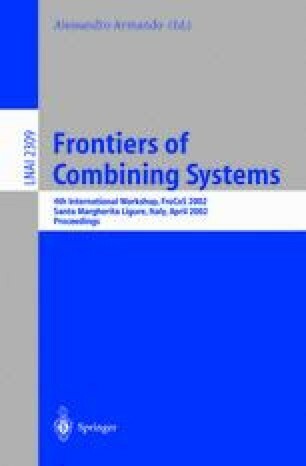 In this work, we discuss our integration of HOL-CASL and Maya into a powerful system providing tool support for CASL, which will also serve as a basis for the integration of further proof tools. CoFI Language Design Task Group. The Common Algebraic Specification Language ( Casl) — Summary, Version 1.0 and additional Note S-9 on Semantics, available from http://www.cofi.info, 1998. M. Kohlhase: OMDoc: Towards an OPENMATH Representation of Mathematical Documents, SEKI-Report SR-00-02, FR Informatik, Saarland University, 2000, http://www.mathweb.org/omdoc.